In an effort of fairness, I’m happily submitting today’s post. I haven’t put together a list of flat caps (or, heaven forbid, tiaras) or Sherlock Holmes costumes for dogs because I do think that a true British dog is far too noble and dignified for such things (American dogs, well, that’s a dog of a different color …). Below is a collection of items that will bring out the British in your dog (regardless of whether he’s really a French poodle or an Irish setter). 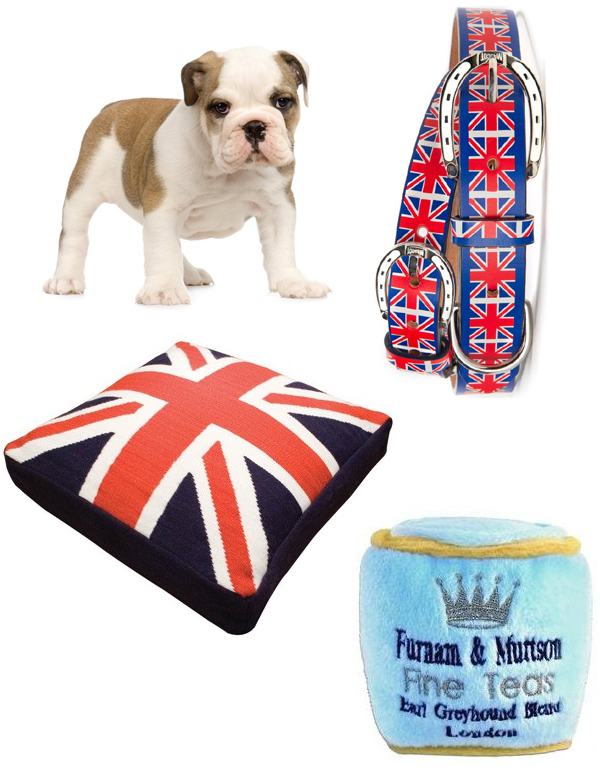 Shown above, beginning to the right of the British bulldog puppy and moving clockwise: Union Jack Collar by Mascot, Furnam & Muttson Squeaky Dog Toy and British Flag Dog Bed by Jonathan Adler. Have a fabulous weekend! Enjoy these last dog days of summer before fall sets in. Posted on 9, September 2011, in Culture and tagged British, Clothing, dog. Bookmark the permalink. 7 Comments. Okay, now I have to ask you, what breed of dog is the homogenized ‘American’ dog, d’you reckon? Hmm… either something miniature and handbag sized with an embarrassing name like a cockapoo … ? Or else the classic golden retriever? Actually, correction! Cockapoos are not as small as I thought and I would be hardpressed to fit one into a handbag! They were first bred in the US though so they are very American. I just had to look up a Cockapoo as I’d never heard of that before! It does look cute but no, it doesn’t look as if it’d fit in a handbag. However did they get a spaniel interested in a poodle, though…. Or how about a Jackapoo! ( jJack Russell x Poodle) Many of these dogs are more expensive than the thoroughbreds. It is a fashion fad. Jackapoo! I haven’t heard of these but they are adorable.